The University of Washington has indeed made a major shakeup on its defensive coaching staff, announcing this morning that coordinator Nick Holt, linebackers coach Mike Cox and safeties coach have all been fired. ...But here's the thing: Being outraged will accomplish nothing. Really, guys? I’m tired of the media and the NCAA trying to explain how USC’s penalties and OSU’s are apples to oranges... ...Today, the NCAA ruled that Ohio State would serve a one-year bowl ban and add 4 scholarships to the 5 they “self sanctioned”. 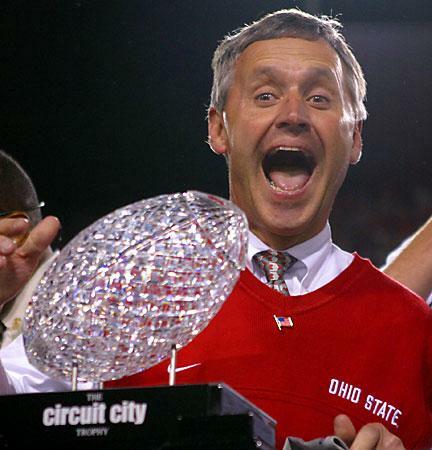 And they hit Jim Tressel in the nuts with the NCAA equivalent of the scarlet letter (how appropriate...). So, for USC’s crimes: 30 schollies, 2 year bowl ban. For Ohio State’s crimes: 27 schollies, 1 year bowl ban. Bo Pelini will likely continue to find himself in the thick of Twitterverse coaching speculation, as he did Monday. [From The Harrisburg (Pa.) Patriot-News:] “Nebraska’s Bo Pelini talked to people at Penn State but is not in the mix, I’ve heard from two highly placed sources.” Pelini told me after practice Monday that nobody from Penn State has approached him or his agent about the head coaching vacancy. “You hear rumors, but … no, there’s been nothing,” he said. Said Osborne: “I’ve not heard anything from anybody at Penn State. And Bo has not mentioned anything about Penn State to me.” So, case closed? Well. … A gut feeling — OK, an informed gut feeling — tells me to keep an eye on this thing. On the field, the Pac-12 of late has produced elite teams but not a lot of depth in the top 25. The current ESPN Recruiting rankings are exactly the opposite. No conference team ranks among the first 15, but five rank between 18 and 25.x USC is 18th, California is 19th, Stanford is 20th, Arizona State is 24th and Oregon is 25th. Of course, recruiting rankings before the first of the year are not unlike the AP rankings in October: It's nice to be noticed but where you finish is what matters. Sporting News picked the 10 best bowl games of the BCS era. Dream, work and play without fear.